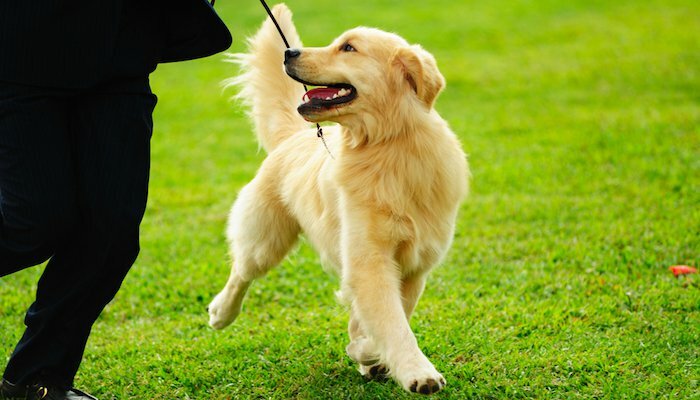 It goes without saying that all the dog owners ought to take good care of their pets overall health in general, and the thing they need to start paying special attention to is the joints. Here are the quick pros and cons of this joint damage care product. 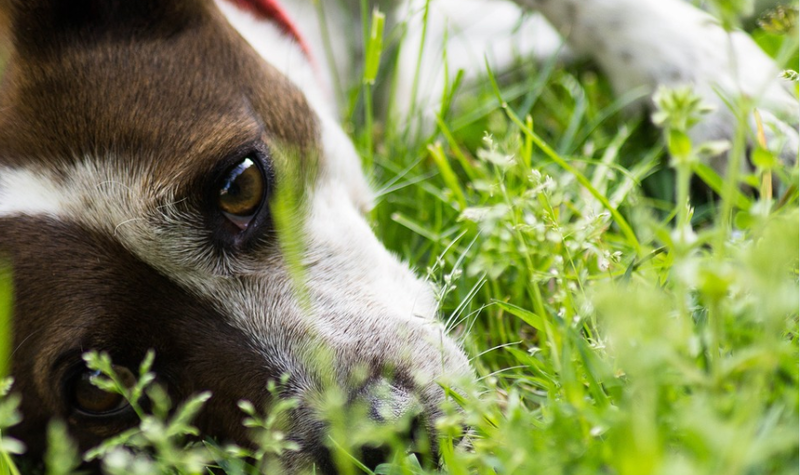 As the pet gets older, the joints experience a lot of pressure on them and in some cases, these once healthy joints become extremely weak which could cause the dog to suffer from immobility or discomfort due to the pain. 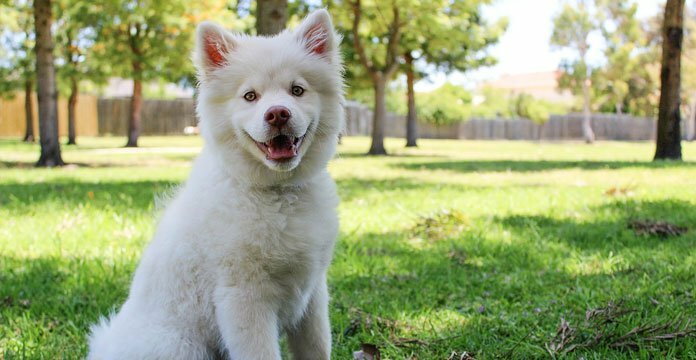 So, if you are a dog owner who loves their dog and wants the dog to live a long, happy and overall healthy life, you will need to do as much as you can in order to help them out in this. Even though you can find various dog food supplements on the market that specifically help out with the dog’s joint problems, the product called the Extend Pet Joint Care is one of the most popular ones on the market today. 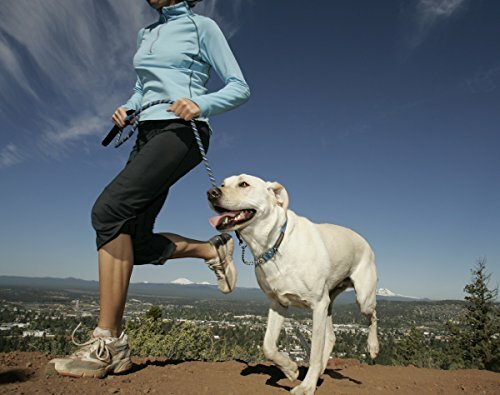 This is a completely natural supplement and it works by supporting the function of the connective tissue in dogs and encouraging the comfort of the joints. This allows your dog to be healthy, happy and above all, active even when the dog reaches old age. There have been many pet owners that have noticed a staggering improvement in the mobility of their pets after giving them these pet supplements. The number of factors influences on the efficiency of this health product and the most important ones of them includes the age of the dog as well as the general condition of the dog once healthy joints whether they have joint damage or not. 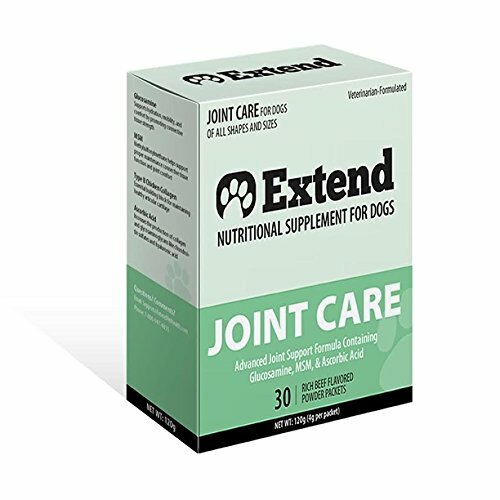 There are various ingredients that can be found in Extend Joint Care, but the most important ones of them include the MSM, Type II Chicken Collagen, Glucosamine for dogs, as well as the Ascorbic Acid. Extend Joint Care for Dogs is extremely easy to administer to dogs – the owner just has to sprinkle one packet of it over the dog’s food once per day. The food can be either dry or mixed with water. One of the most important thing when buying this product is avoiding the free trials because by agreeing to it, you will automatically be billed every single month, even if the trial period has ended. The recommended place for the purchase of this supplement has to be Amazon. This product has proven itself and is considered to be one of the most popular joint damage pet supplements among the dog owners. The biggest complaint people have on Extend Joint care for Dogs is the fact that the product comes with a free trial on their company’s website, which automatically bills you every single month until you cancel it. Therefore, it is better just to buy the product from Amazon, and by doing it, you avoid the auto-ship. This product is not the same as all the other glucosamine based products, mostly because it comes in powder form, but that makes it that much better because you can easily administer it to your dog if he does not like the chewable tablets. 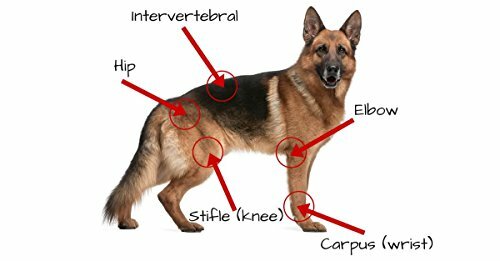 that is designed especially to help out with the nourishing, strengthening and healing the joints in your dogs, as well as their cartilage. This is a nutrition supplement which is 100% natural, and the way it works is by supporting the function of the connective tissue, which further promotes comfort in the healthy joints. This, in turn, allows your dog to be healthy, happy, and active, even if the pet has reached an old age they can still manage to heal and strengthen joints or fight off future signs of joint damage. This is something all dogs wish to have, and with Extend Joint Care, you can give it to them. What’s great about the Advanced Joint Support formula is the fact that with it, you get a 100% guarantee that you are going to get your money back in case you are not satisfied with the results that the product has had to offer. So, after giving this health product for a couple of weeks, and you still don’t see any improvement in your dog’s behavior or overall health, you are free to complain and get your money back. However, this will hardly happen, because this particular product has been seen as one of the top products and solutions for the aging that could be found on the market today. This is mostly because of the fact that this product is both safe and completely natural. The number one question that most people ask before they purchase this health product is if it actually works. And this is a smart thing to do because everyone should first become completely informed about the product, and only then should they proceed with the purchase. The answer is that the Extend Joint Powder really does work. Many dog owners have said that they have noticed that there has been some serious improvement in the mobility of their dog after it has started taking this supplement. Even though this product does not work the same for all K9’s, it is clear that a lot of K9 owners say that this supplement has helped out their pet a lot. However, it should be known that the efficiency of this product depends on certain factors, and some of the most important ones are the dog’s age and the condition of the dog’s joints. Most of the people that have been giving this supplement to their dogs say that they have noticed a real improvement in their pet’s behavior in the very first two or three weeks of taking the supplement. This is great news, and especially when you compare the effect of this health product to the effects the other products you can find on the market have to offer. What is amazing about this product is the fact that it offers no side effects, or at least none of them have been observed by the experts. However, it needs to be said that the Extend Joint product does contain glucosamine for dogs, which is known to upset the stomachs of some pets and cause some gastrointestinal issues as well as the increased urination. If you observe these or any other potential side effects of this product, you should immediately stop giving it to your pet, and take it straight to the vet. There you’ll get the answer of what to do next. 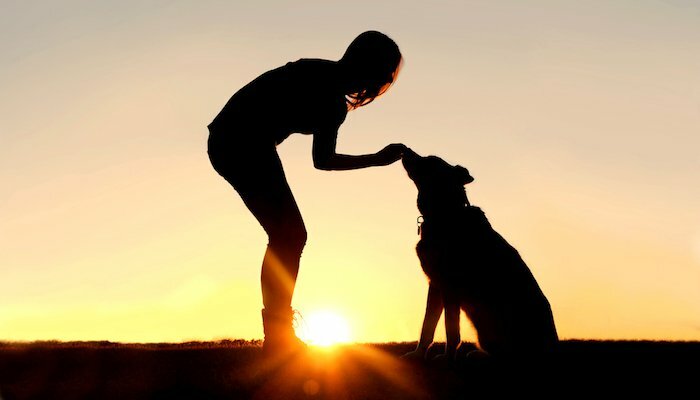 One of the main ingredients of the Extend Pet Joint is methylsulfonylmethane, which is an ingredient that offers support to the proper maintenance of the connective tissue; which in turn provides the dog with a much bigger comfort in the joint area. Of course, this is just one of the various ingredients found in this supplement, with another important one being glucosamine for dogs, which hydrates the pet and increases their mobility as well as the level of comfort. This product also contains ascorbic acid, which is the key player in increasing the production of collagen and glycosaminoglycans. Some of those include the chondroitin sulfates as well as the hyaluronic acid. Also, this product contains the Type II Chicken Collagen which is great at building blocks which maintain healthy articular cartilage, which is something that each and every dog needs to be active and to stay mobile without any discomfort. What most dog owners find great about this product is the fact that you only have to give your furry friend one dose of Extend Joint health product per day, and also the fact that there is no loading dose necessary here, unlike in other pet supplements. The dog owners that buy this health product should never give their dogs more than one dose per day, and if they’re not so sure about it, they should consult their veterinarian for the information about the proper dosage, just to be sure. However, the chances are that the vet is going to tell them the very same thing – the dogs should only get one dose of this product within a 24 hour period. Another question that so many dog owners have been asking is where exactly to buy this product. Well, if those owners are interested in having the best overall health for their dogs, they really ought to visit Amazon, which offers the top deals on these products, including the MSM tablets that your pet can take. They have very results for your pets health and great reviews to go along with it. This will allow the dog owners to use this to offer an extended and healthier life to their furry friends at the lowest possible price. This means that if you buy this product on Amazon, you won’t really spend a lot of money on it, and you’ll still manage to buy everything you need for your pet. 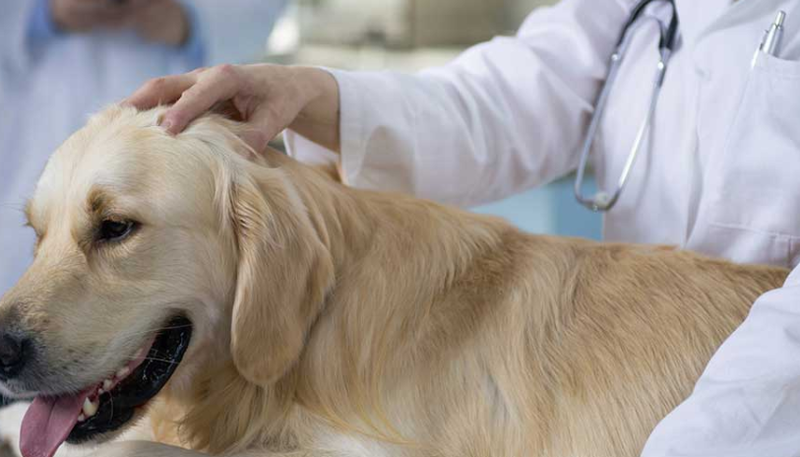 Ensure that you only buy the top health medicine for your pet to ensure the best results. Make sure you avoid all the free trials of this health product, because such trials usually automatically bill the customer every single month straight from your credit card, even after the trial period. Therefore, direct purchase from Amazon is the way to go. For more info on glucosamine – see this study. Love this stuff, my Bonnie is so much happier! Good review, thank you for showing me the lowest price too! Carrie, that really helped me out. Thank you for writing this review. Great review on Extend Joint Care, Carrie! reporting! Keep up the amazing works guys I’ve added you guys to my blogroll.